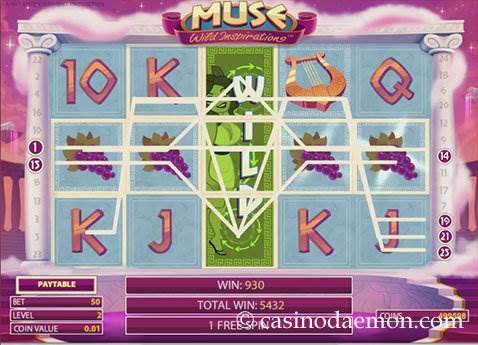 Update: Unfortunately, the Muse slot is no longer available. 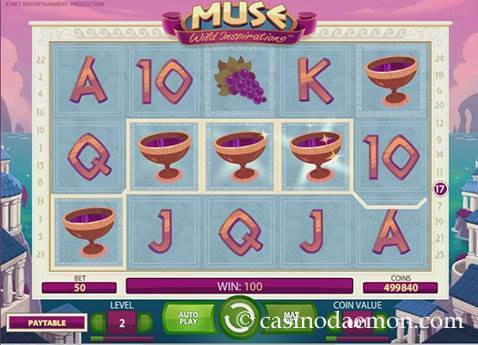 Muse Wild Inspiration from the developer Netent is a slot with ancient Greece as the theme and symbols drawn in a cute comic style. Meet the three beautiful goddesses in a tranquil seaside town, and win up to 590,000 coins in the slot that mainly focuses on special wild features. The special wild features include expanding wilds, sticky wilds and multiplier wilds, and you can also trigger up to 30 free spins with combined wild features. The variance of the slot is relatively low, and you will probably get frequent winning combinations. The special wild features also trigger often, and they will keep you on the edge of your seat when you play the game. This game is good for players who wish to play just a few rounds, as well as players who want to enjoy a game for a longer time. Although the free spins can really make it worth your while, the payouts in the base game can also be very good. The theoretical return to player is 97%, which is above average for an online slot. 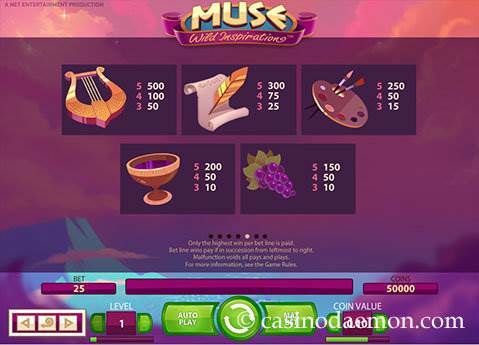 Unfortunately, you cannot play Muse Wild Inspiration on mobile devices, as the slot is not yet optimised for mobile play. The special features of this slot include three different wild symbol features that trigger with the corresponding goddess. The Expanding Wild will cover the entire reel, the Sticky Wild will stay on its position and award a free re-spin, and the x2 Wild will double the payout of the combination it completed. The scatter symbol with Hermes' sandals triggers the free spins. You can get 10, 20 or 30 free spins for 3, 4 or 5 scatter symbols respectively. During the free spins you can get combined wild features that will make the spins even more interesting. You can get either a Sticky x2 Wild, an Expanding x2 Wild or a Sticky Expanding Wild. 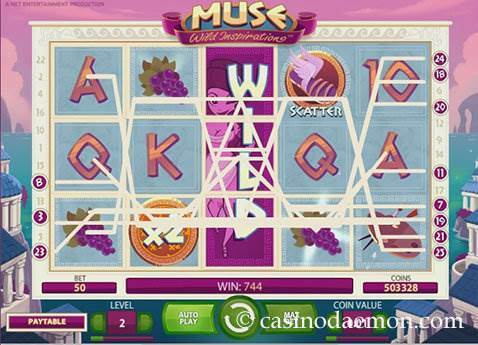 The Muse Wild Inspiration slot has 5 reels with 25 fixed pay-lines. You can play the game with coin values ranging from 0.01 up to 0.50 £/$/€, and you can select to play up to 10 coins per line. The minimum bet in one spin is 0.25 £/$/€, and you can play up to 125 £/$/€ per spin.